← Does the Anti-Vaccine movement exist because of the undeveloped social media voice of Healthcare Professionals? 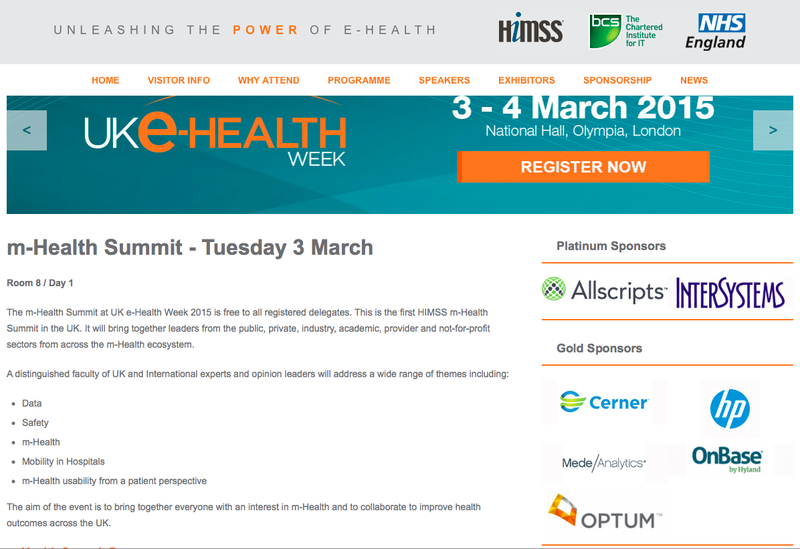 Next week at UK eHealth Week in London there will be the first ever mHealth Summit to be held in the UK. This is a new addition to the mHealth Summit series of events (the highlight of which is the Washington DC event that is now in it’s 6th year and attended by more than 4,000 delegates) and won’t be replacing the annual European mHealth Summit event that has been held together with the ‘European eHealth Week’ (eg. in Copenhagen 2012, Dublin 2013, Berlin 2014 and on 11-12 May this year in Riga, Latvia) but is an addition to the UK eHealth Week meeting being held at Olympia, London, that’s being organised by HIMSS UK together with NHS England and the BCS Chartered Institute for IT. Although invited to present I unfortunately can’t make it as I’ll be out in Barcelona attending Mobile World Congress but the speaker line up looks very interesting, it’s CPD credited and free to attend for anyone attending UK eHealth Week (free to attend for healthcare professionals who do any work in the public sector). Follow @UKe_HeathWeek, keep a watch out for the event hashtag #eHW15 and click here for more info and to register. Related: Can’t make London on the 3rd March? Find an event near you on this definitive listing of mHealth events being held in 2015.